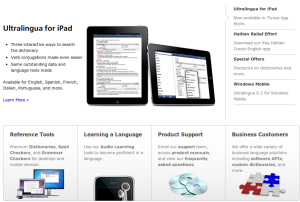 Ultralingua, Inc. is a software company that makes products for people who love languages. Their website is a place for people to access a free online dictionary, download product trials, and purchase software for personal use. It is also a hub of information for business partners and offers a technical support section for customers. Ultralingua competes in the market for software-based language tools such as dictionaries, spellers and grammar checkers. Their customers include teachers, students, translators, and multi-lingual professionals from a host of industries. They also sell to many organizations including HarperCollins, the Government of Canada, Hachette Multimedia, netTrekker, and Texthelp who purchase site licenses and embed OEM, APIs, and web versions of their products. Ultralingua began work to transition to Drupal in 2009, and launched their new Drupal-based site in early 2010. By mid-2009, Ultralingua had been using a series of static pages as its website for several years, and they were ready for a change. Their company and product lines were growing quickly, and the system they were using at the time couldn’t keep up. With a team of developers on staff already, the company had the internal expertise to take on the development of the new site themselves. "We had done traditional web development before, but Drupal was completely new to us," explained Bret Jackson, Ultralingua’s web developer for the project. "We chose Drupal because such a large community supports it, and we could see quickly that the documentation and help forums would be an asset during the initial phase. We picked up the new terminology and structure quickly, but the early development stages came with some interesting challenges nonetheless." Ultralingua’s website is the primary channel through which they market and sell their products, so they had to build in the tools they would need to communicate with customers and process sales effectively. Because they were new to Drupal, they ended up creating custom solutions to some of the challenges they faced rather than manipulating existing themes to get the results they were looking for. Another goal the team had was to make it possible for individuals with limited technical expertise to edit content on the website. This was something their old solution did not allow, and it was hindering the company from creating content quickly enough to keep up with product releases. They also set goals to better integrate analytics and reporting into the structure of the site. A website would also help Ultralingua communicate to their customers what sets them apart: their model for creating premier language software by bringing language and software experts together to create the best product possible. Language is constantly evolving and their software developers work directly with linguists and researchers to create language tools of the highest quality. Ultralingua wanted to implement a custom mega dropdown to allow site visitors to navigate directly to pages that contained information about specific products. Drupal’s menu system wasn’t able to generate the results they were aiming for, so Jackson went to Drupal’s support forums to track down an answer. Many other developers had a similar problem, and there weren’t many good solutions available. The team took a look at their options and decided to use blocks instead. Overall, the Ultralingua website team is happy with the results they got using blocks for navigation. However, the choice had some interesting implications for their ongoing maintenance flow. Blocks aren’t part of the revision system, so any changes that need to be made to the navigation need to happen separately on the dev version of the site. Ultralingua’s website team had to create an internal process that allowed the marketing staff to make changes while coordinating their release with those the web developer had to make. Although this complicates things a bit, they are satisfied with the results as a whole. It’s important to us to communicate with our customers in the languages they speak, and about half of our users are native speakers of languages other than English. We have large groups French, Spanish, and Portuguese users in particular, so localizing our content into those languages was something we wanted to do straight away. When they added new localization to their site, they saw an increase in traffic as well as in sales. Their original solution for localization was a basic translation module. Using this system, Ultralingua had their content translated outside the Drupal system entirely and then had someone on the website team enter all the translated content into Drupal manually. Localizing more than 30,000 words of content this took months, but it was the only option they thought was available at such an early stage. When they discovered the Translation Management module, things changed. It is easy to find and review professional translators to work with. Assigning nodes for translation and communicating with translators while work is in progress is simple and straightforward. The review and proofreading options are helpful. Quality of translation is extremely important to Ultralingua, and the translators they find through ICanLocalize consistently impress them. One of the biggest hurdles involved their Workflow module, because at that time the Translation Management module wasn’t compatible with it. Ultralingua and ICanLocalize worked together to create and test a solution with their system, which now makes it possible to easily send newly translated content to editors for review. Moving to Drupal brought a lot of benefits to Ultralingua’s content management team. Drupal’s workflow and revisioning systems make it possible for various individuals at the small company to work on the site. Integrated translation management means that all new contents are available in all languages, without spending time coordinating changes with translators. We come out with new products all the time, so we like working with Drupal because it is easy for us to use the tools to get content out quickly. The set-up we have now really puts us in control. Is Language Agnosticism the Future of Software Development?